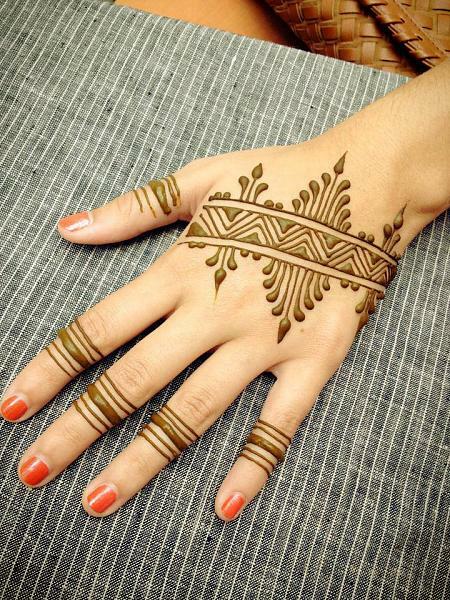 Karwa Chauth is around the corner and I am so excited about getting mehndi done! This time I plan to go with a simple yet quirky design. Don’t want my hands full, however it needs to be a style statement for this year’s most awaited festival for us ladies! There are some basic categories of mehndi designs, such as Gujrati, Rajasthani, Marwari, Arabic and African patterns to choose from. They have certain prominent motifs or symbols that distinguishes one from the other. I just can’t seem to stop experimenting with these styles. From circles to squares, peacocks and paisleys, checks and dots and what not. But my all-time favorite is a simple, curling vine, of course finger tips covered with thick coating of aromatic mehndi (which is so traditional). Quirky patterns include traditional as well as non-traditional patterns tweaked to one’s own liking. This includes animals, unusual floral design, hearts, stars, moon and sun. But then, these unusual designs can be really simple and eye-catching! For some extra embellishment, mehndi artists also apply colors, gems, crystals and glitter paint. Mehndi takes around 3 hours to dry once applied. Besides, keep another hour as buffer. Stay comfortable. No tasks to be undertaken and also make sure to stay away from texting/making calls etc. at that time. 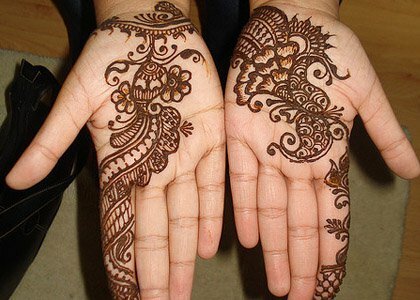 Apply a mixture of lemon and sugar after 30 minutes to 1 hour of mehndi application on your hands. It enhances the color. If you want mehndi to dry quickly, expose it to heat. Hair dryer can come handy! Alternatively, you can steam the design, seal it, and wrap it up with polythene bag. Apply mehndi atleast 2 days before Karwa Chauth. The colour usually gets richer over the first couple of days. So, don’t keep it for the last day! Don’t go for a complicated/highly detailed/intricate design (Marwari or Rajasthani design) if you are a super busy lady. It will obviously take more time for the paste to dry. If you really want to go for one, then Zuri recommends using a hair dryer as it helps mehndi dry faster and stain quicker. Mehndi is such a pretty ornament to wear on special occasions, wedding and Karwa Chauth being the most important of all. Such an art and so much fun. Aromatic and beautiful when being applied, crisp when drying-up and so much happiness it gives when stays for long. Oh! I am so excited and hope you are too!